Christianity reached China as early as the 7th century. This was the Eastern form of Christianity sometimes known as Nestorianism ➚; in China it was called Jingjiao 景教 and associated with the Roman world. Jesus is transliterated as 耶稣 Yē sū in Chinese. The faith converted some senior officials, eunuchs and concubines and had a brief but wide influence. It could well be that this community is the origin of the ‘Prester John ➚’ story that circulated Europe in the 12th to 17th century - that an isolated Christian kingdom existed in the East. The famous Nestorian stele ➚ (an inscribed stone slab) was erected in 781 at Chang'an. The stele's discovery in 1625 was used by the Jesuit missionaries in Beijing as evidence of Christianity's long standing status as a religion in China. The Manichean ➚ faith which is considered a mix of Christianity and Zoroastrianism also prospered during the Tang dynasty until the brutal suppression of all 'foreign religions' in 843. A visitor to Baghdad in 987 reported that all the Christian churches lay in ruins and there were no Christians to be found. The isolated Jewish community at Kaifeng fared better, it lasted about one thousand years and when it was discovered in the 19th century it caused great excitement. During the Yuan dynasty, the Mongols welcomed people from many countries including Christians such as Marco Polo. However during much of the following Ming dynasty this 'foreign' religion dwindled. From about 1365 onwards nothing is known of the fate of the Nestorian Christians in China. At the start of the Ming, in 1371, an ambassador was sent to Rome (known to the Chinese as Da Qin ➚) to inform the pope of the founding of the new dynasty. Towards the end of the Ming dynasty an important Jesuit mission to China was led by Matteo Ricci SJ. They decided to focus their efforts on converting the Emperor and senior court officials to the faith rather than the poor of coastal towns that other denominations were targeting. They were trained in mathematics and astronomy so they could impress the Imperial elite into taking their religious teachings seriously. Although they made early advances the fall of the Ming dynasty in 1644 led to a gradual diminution of their influence and the numbers of Christians dwindled. The last Dowager Empress Wang of the Ming dynasty converted to Christianity and her son (Zhu Youlang ➚) was baptized a Christian in 1648 but he fell into Manchu hands and died in captivity. This move was partly made in the hope that the European Christians would help her restore the Ming dynasty to power. In the seventeenth century other missions by Dominican; Franciscan and Cistercian established brief footholds in the southern coastal ports. The Dominicans and Franciscans went among ordinary working people, but Jesuits lived in luxury among the educated elite. Jesuits were men of science as well as religion. In fact Adam Schall complained about spending too much time on science rather than missionary work. European skills in cartography led the Qing emperor Kangxi to task the Jesuits with production of a map of the entire Chinese empire; however it was the new European methods in astronomy that really impressed the Chinese. Matteo Ricci translated the Elements of Euclid ➚ into Chinese for the Emperor to read. Emperor Kangxi became a close personal friend of Adam Schall and used to frequently visit him. Adam Schall and Ferdinand Verbiest followed Ricci and won a competition to make the most accurate prediction of a solar eclipse against the Chinese astronomers using traditional methods. They succeeded because Chinese astronomical knowledge had relied on methods that were no longer fully understood and so could not be refined. The Jesuits took up Imperial posts at the Bureau of Astronomy in 1629 and revolutionized Chinese astronomical methods. Some of the instruments still to be seen at the Beijing Observatory ➚ were designed and built by them. They also helped design parts of the new Qing Old Summer Palace using the latest European architectural style and novelties such as water fountains. The convert Shen Fuzong was brought back by the Jesuits to Europe. He was greatly admired and met many kings and scholars. Shen spoke in Latin. He helped the British sinophile Thomas Hyde catalog the Chinese books at the Bodleian Library ➚, Oxford. His visit stimulated further interest in China, particularly as conversion to Christianity was evidently possible. It is misleading to think of the Jesuit mission as one of imparting European knowledge to China, it was very much a two way transfer. Documents at the Vatican demonstrate the huge interest in Chinese science and technology back in Europe. It has been suggested that leading philosophers such as Leibniz based their discoveries on this new information. Fascination with all things Chinese led to the fashion for Chinoiserie in Europe, many stately homes had a 'Chinese room' in the 17th-18th centuries. Another stumbling block for the Jesuit mission was one of doctrine. Matteo Ricci believed that the way to convert the Chinese was to adapt the Christian message to reflect Chinese heritage. To achieve this the ancient rite of 'ancestor worship' had to be accommodated. After a century of debate the Pope outlawed the Chinese rites ➚ in 1707, undermining the efforts of hundreds of missionaries in China. The Emperor responded by banning the religion, expelling the missions and the only churches allowed to remain were at Guangzhou and Macau. For ordinary Chinese, these missions were greeted, in the main, by incomprehension and hostility and did not persist. Part of the problem was that traders had infiltrated the missionary ranks, in 1703 Emperor Kangxi commented that among the missionaries were: ‘mere meddlers ... out for profit, greedy traders who should not be allowed to live here... I fear that some time in the future China will get into difficulties with these Western countries’. Western Missions to China of many different denominations began in the nineteenth century. As they were seen as part of Western colonial plans they were widely distrusted; missionaries were targeted and killed during the Boxer rebellion (thousands of Chinese converts; about 200 Protestants and many Catholic missionaries). The missionaries for their part often had a rather patronizing attitude to the poor ‘barbarians’ they had come to save and had little to do with them. Attitudes began to change from the 1880s when T. Richard; W.A.P. Martin; Y.J. Allen and others began to take account of Chinese traditions and founded schools; libraries and universities. Their message became one of salvation through reform of the Chinese state and reached the ears of such men as Li Hongzhang and Sun Yatsen (who became a Christian). A second spurt of Christian missions in the 1920s was brought to an abrupt end in 1951 when the Communists sought to extinguish all influence by foreign countries and even indigenous religions. Because many Christian missions were supported by unfriendly foreign states (especially America) all the local Chinese who attended church were suspected of sympathy with foreign powers. 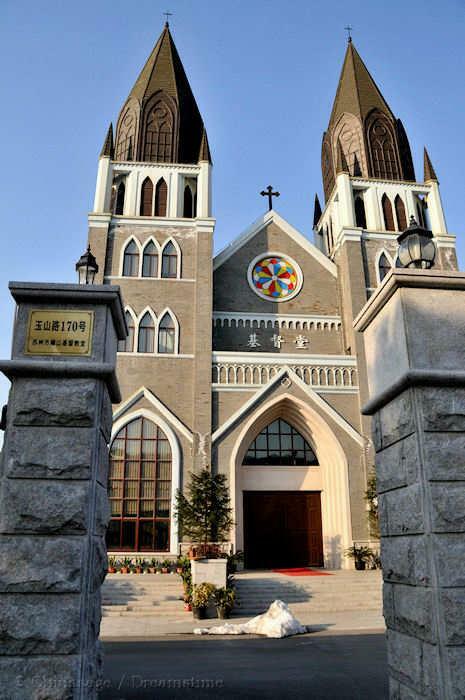 It has only been since the 1980s that Christianity has been allowed to grow in China, particularly in urban centers; even so because control by foreign agencies is not permitted by the Communist Party there remains a particular problem for Roman Catholics who are not allowed to take direct orders from their leader the Pope. The government remains concerned that the unofficial, underground churches may form seditious mass movements. There continues to be confusion about the total number of Christians in China. Estimates consider that there are about 60 million protestant Christians in China and the numbers are growing rapidly. Because of the huge population of China it is quite possible it will be the most Christian country in the world within forty years if the growth rate continues. However, it has to be borne in mind that the traditional Chinese attitude to religion hascontinued. A Chinese person will attend Christian, Buddhist and Daoist ceremonies in the same month and not feel any sense of disloyalty. Some Chinese have been interviewed and profess they like a Christian service not because of its religious appeal but because they like singing together. 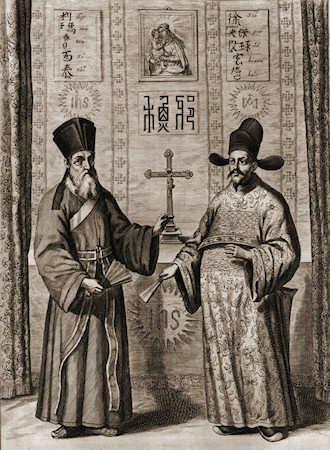 Matteo Ricci and Paul Xu Guangqi From Athanasius Kircher, La Chine … Illustr?e, Amsterdam, 1670. Image from web page ➚ Image available under a Creative Commons license ➚. The Italian Matteo Ricci was one of the first to build a bridge of understanding between Europe and China in the late 16th Century. Members of the Society of Jesus ➚ (Jesuits) founded in 1540 by Ignatius of Loyola ➚ sought to convert the vast population of China to Catholic Christianity. Up to 900 Jesuits took their European knowledge to China. They had been carefully taught in the disciplines such as astronomy that they believed would be of use in China. It soon became clear that the way to convert the Chinese was to persuade the Emperor and his court to embrace or at least endorse the religion rather than convert his subjects. Ricci reached Macau, China in 1582 and spent some years in the southern provinces where he mastered the language and culture. He took to wearing the garb of a Confucian scholar to gain acceptance. Ricci came to court in 1601 where he described China as ruled by a philosopher élite - close to the Platonic ➚ ideal for state governance. Although never meeting Emperor Wanli himself he was feted by the Imperial court. The insular and paranoid scientific culture at the time banned the independent study of science, science was only for the appointed officials at court; so Ricci had his books on mathematics confiscated. Matteo Ricci became skilled in the language and culture of China, and wrote books in Chinese. His Chinese friends admired his memory skills; he is believed to be able to instantly memorize a page of 500 Chinese characters recalling them in either forward or reverse order; he used a technique called memory palaces ➚. Matteo devised the first transcription of Chinese into Latin letters, centuries before pinyin was created. They also appreciated the artifacts he had brought from Europe and the latest maps of the World. Ricci succeeded in converting three leading scholars at court (the Three Pillars of the Early Christian Church ➚: Xu Guangqi; Li Zhizao and Yang Tingyun) as well as a number of eunuchs and concubines. The fall of the Ming dynasty in 1644 proved fatal to the Jesuits' ambitions. Some Jesuits stayed with the Ming loyalists who fled south, others turned their efforts to convert the new Manchu conquerors. Seeking support from the ‘foreign’ Manchus for a ‘foreign’ religion further alienated the Han Chinese at court and led to a long term decline in Christianity. Another cause for decline was division between the different missions, the Franciscan and Dominicans worked in poverty among the poor while the Jesuits lived a life of luxury and accepted ‘heathen’ practices. On his deathbed in 1610 Matteo Ricci was confidant of the eventual success of his Christian mission he said ‘I leave before you an open door’. Matteo Ricci is buried with a number of his Jesuit fellow missionaries in a small Christian cemetery ➚ in Beijing. His work was continued by the German Johann Adam Schall von Bell ➚ and others in China. Citation information for this page : Chinasage, 'Christianity in China', last updated 30 Oct 2017, Web, http://www.chinasage.info/christianity.htm.